After building a system of homemade mini-gutters to collect rainwater, the next project would be to find a suitable receptacle. The most popular container would be some sort of a rain barrel. Plastic drums are the most widely available. Unlike metal drums, they won't rust and are reasonably durable. Pricewise, some are more affordable than the others. The cheaper ones generally have thinner walls, but the thick walled ones, although a bit pricier, will last a very long time. Some plastic drums have screw-on covers, others have lids and others just have a small opening for a hose. The plastic drum that was used for this project has a screw on cover that had a big dent (damaged) on its top. That gave the idea of creating a hole on the top cover for the gutter hose or downspout. This, rather than passing the hose into the drum and then covering, because that will create an opening for all sorts of problems. Any rain barrel that isn't adequately covered will invite mosquitoes. Dengue, particularly, is a real and potentially fatal disease in tropical countries brought about by the Aedes aegypti mosquito. Mosquitoes look for quiet standing water which is exaclty the kind of environment to be found in rain barrels. 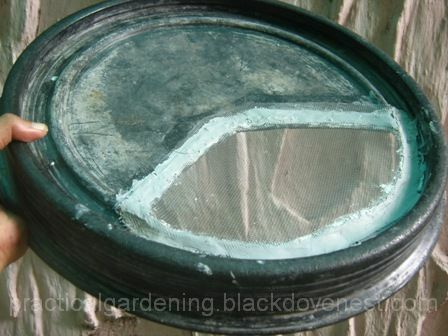 Rather than creating a hose opening that is sealed along the edges , this simple DIY project makes use of cover that has a screened opening, in other words, a filtered cover. This cover allows a hose or pipe to be positioned anywhere on top of the cover and will allow rain water to fall through the screened opening. With a pencil, mark out a "pie slice" which is 1/3 of the top surface of the plastic drum's cover. Using a nail and a hammer, punch holes along the edges of this marked area. The number of punch holes that will be enough to allow a hacksaw blade to go through. Insert a hacksaw blade and saw along the marked edge of the pie slice. With a piece of sandpaper, smoothen the rough edges or burrs on the sawed out hole. Cut out a piece of window screen that is bigger than the sawed out hole by 1 inch along the edges. This way, the window screen covers the hole and has an extra 1 inch at the border. Liberally apply heavy duty clay epoxy on the 1 inch border of the window screen. Position the window screen on top of the hole so the epoxy is sandwiched between the window screen and the cover. Cut strips of duct tape to secure the window screen on top of the cover as shown below. Allow the epoxy to completely dry and harden. When the epoxy has hardened, carefully remove the strips of duct tapes. Liberally apply the same epoxy on top of the window screen's border as shown below. This will strengthen the bond between screen and cover and will also smoothen the rough areas of the window screen. Allow the new application of epoxy to completely dry and harden as show below. 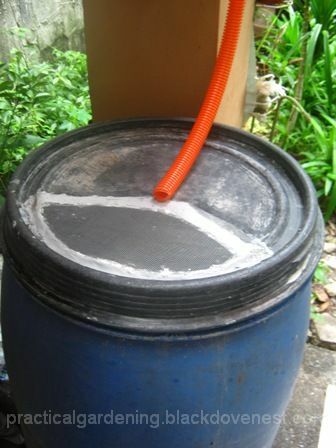 Prevents mosquitoes and other insects from entering the rain barrel. 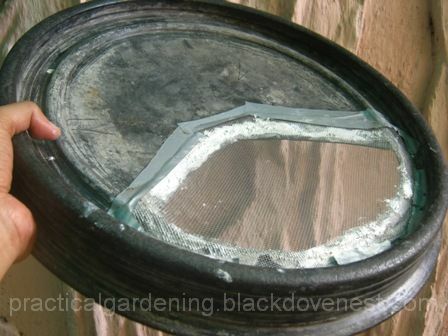 Since the filter makes use of ordinary window screens, mosquitoes and many insects cannot enter the barrel. The standing water inside will not become a breeding ground for insect larvae. Prevents debris from entering the drum. Debris include small stones, leaf and foliage particles. They simply collect on top of the screen and are easily removed by taking the cover off and tapping it. No need for special sealing attachments. Any hose or pipe that drains rain water can be positioned anywhere on top of the filter cover. There is no need for holes and seals that will be customized for the drain hose or pipe.